If you are an individual with a disability and believe you have been discriminated against, it is often hard to find a lawyer to help remedy your situation. Accordingly, 'self-help' may often be your most, or your only, viable strategy. But how to proceed? This book serves as a badly needed practical guide to disability discrimination law. Covering a wide range of issues faced by individuals with different kinds of disabilities, it not only describes those individuals' legal rights but also suggests solutions to disability discrimination issues that are more practical and less expensive than filing a lawsuit. Written by two disability law experts, Ruth Colker, whose son is developmentally disabled, and Adam Milani, who is paralyzed from the chest down, this book is informed by their scholarly expertise but is also based on their collective practical experience from years of navigating issues of disability discrimination. 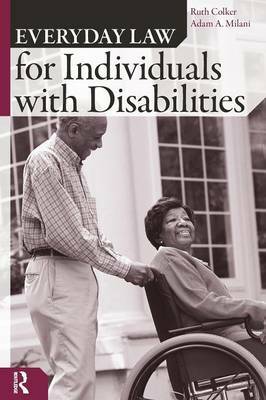 Everyday Law for Individuals with Disabilities is the first in a series of practical guides to the law, organized by series editors Richard Delgado and Jean Stephancic, packed with useful overviews and advice for the people who need it most and can least afford it.